Writing Skills Training Material for developing employee advanced writing skills. Train your organization advanced writing mechanics, the three C’s of writing, how to deal with specific requests, writing business documents and much more! Seeing is Believing This sample manual to teach Advanced Writing Skills is in MS Word format. Your readers will be sincerely interested and engaged by your writing if your message has been designed to capture their full attention. In order for your writing to be immediately appealing to an audience, it must be perfectly crafted to move readers along as smoothly as possible. Your audience demands easy access to the information they want to find through their efforts of reading. Our training materials for Advanced Writing Skills are focused on teaching students the importance of producing “reader-centric” writing. We believe that readers will understand and retain information if language, meaning, and intention are successfully expressed by the writer. We believe our customizable training materials are an invaluable resource for instructors wanting to develop characteristics of professional writers in any learner interested in gaining advanced writing skills. Our training materials for Advanced Writing Skills teach students how to practice their writing so that it is compelling and effective. Our writing team has excellently designed the Advanced Writing Skills training materials to exemplify the importance of writing so as to please readers. Our training materials for Advanced Writing Skills provide your learners with methods for producing clear and concise writing to entice their audience to continue reading. Writers who become professionals in their trade have developed their skills through practice and experience. Organizations and businesses that invest financial resources to educate their personnel in developing advanced writing skills will experience positive, measurable results. Instructors of our Advanced Writing Skills training materials receive the essential tools to teach their students how to leave a lasting impression on their readers. The knowledge and information gained and retained by your audience can be transformed into an active response. Our customizable training materials for Advanced Writing Skills allow instructors to instill confidence in their students to excite their readers. Through their newly developed writing skills, students will elicit an active response in their readership, in accordance with the intentions of their writing. Want to see the topics you will cover in this course? 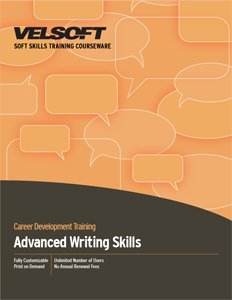 Check out the Advanced Writing Skills Course Outline.